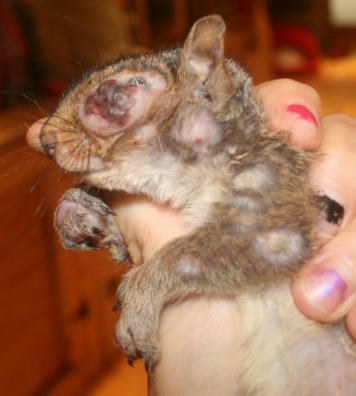 Squirrel pox, or squirrel fibromatosis, is an awful disease that affects squirrels. 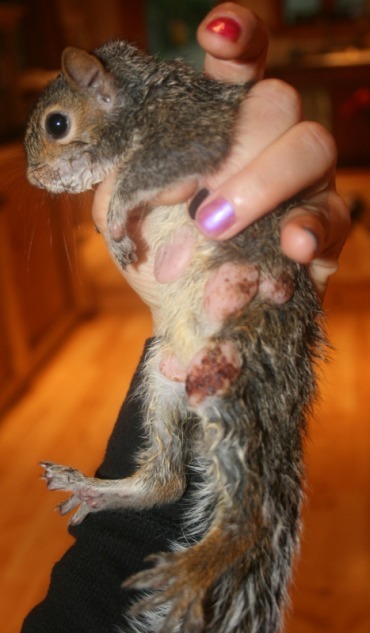 Unlike human chicken pox, squirrel pox is not a herpes virus. It is transmitted via blood, so mostly individuals contract it through biting insect vectors, such as fleas or mosquitoes. 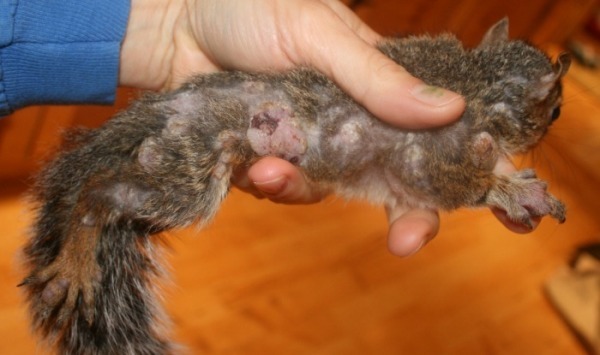 The diagnosis for squirrels with pox is most always eventual death and many vets recommend putting the animal down as soon as the disease is diagnosed as it is commonly believed that the infected animal will only get worse. 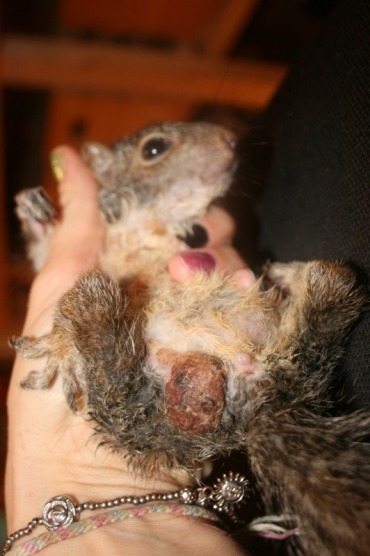 As a rehabilitator it is incredibly frustrating admitting a squirrel with this disease. 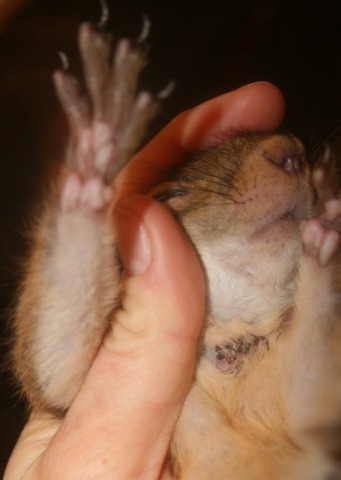 I received a litter of 5 individuals in the summer of 2009 and was determined to get them well. But the more research I did the more I realized that there has not been robust studies on the disease; how it presents, its progression, how the body copes with it, what drugs are effective, etc. 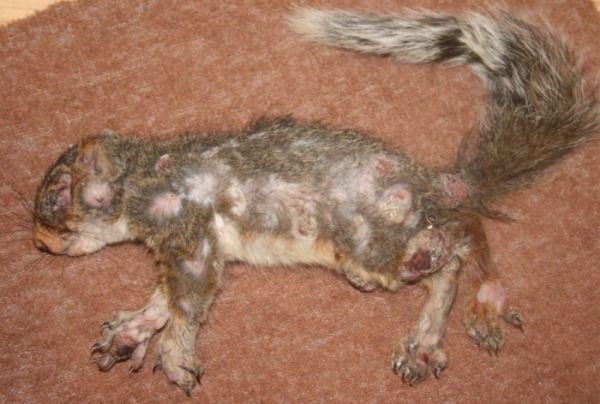 Sadly I see this again and again: there is no money to research diseases in animals like squirrels who people feel have no economic value. 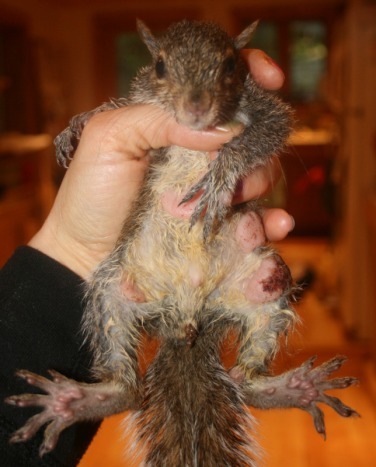 Because of this I decided to try to document this case study the best I could in hope that it will hope other rehabililtators and vets who receive squirrels with fibromatosis. 3 August: Lila, Lucas and Joshua the opossum. 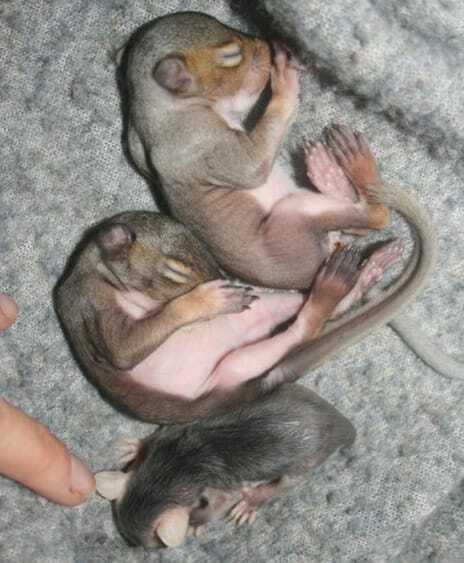 On 3 August 2 5-week old squirrels were admitted to Wild Things. They were totally healthy. I put in a little lone opossum with them as he had lost all his brothers and sisters. 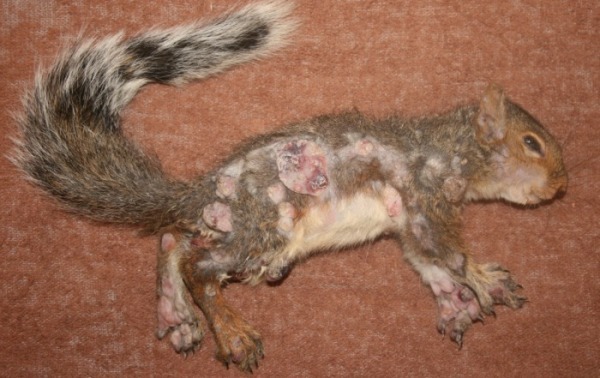 13 August: Litter of pox infected squirrels. 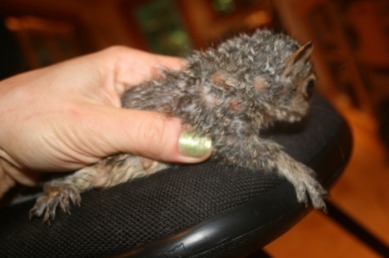 On 12 August, some good Samaritans brought in a baby (~6 weeks old) who had fallen out of a nest in College Town, Ithaca. The nest was squeezed between 2 buildings about 25 feet up. They reported that they heard more babies up there. 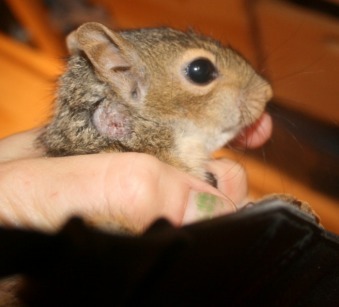 The little one who they brought in had a few (~5) small swellings that looked like mosquito bites. 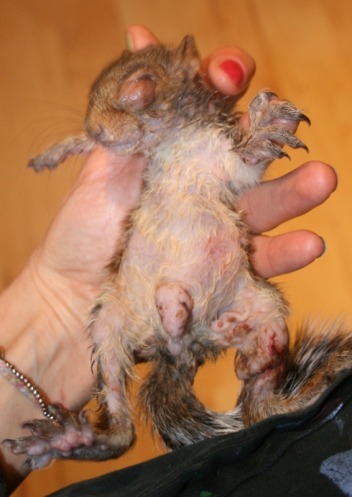 He was crying, dehydrated and had fleas, both indications that the mother was not around. And indeed, the Samaritans had watched the area all day and not seen an adult squirrel return to the nest. I brought the baby to the vet that day to have the lumps investigated. They said they looked like bites and the baby should be fine. 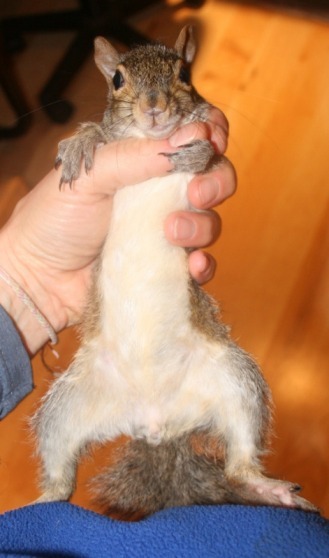 I put him in with the 3August squirrels, Lila and Lucas (above). The next day another baby fell out of the nest and a volunteer and I brought a big extension ladder and managed to get the other 3 babies from the nest. 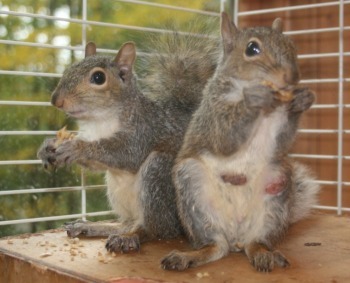 One look at the other babies made it clear that the lumps were not bites but the dreaded squirrel pox. These individuals did not have small isolated pox but large swellings, covering whole folds of skin. A few of them had Sharpei (the "wrinkly" dogs) like folds of swollen skin. You can see in these pictures that the pox were all over their bodies: front, back, eyes, toes, ears, etc. 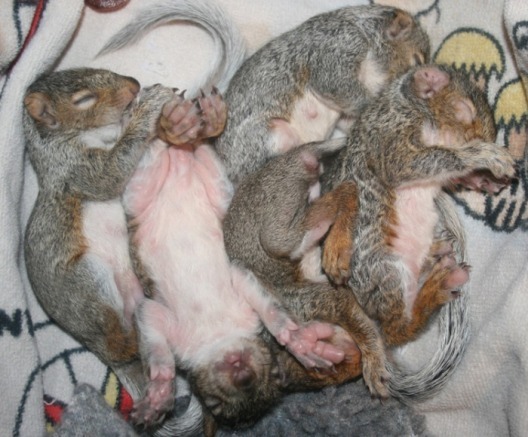 The original 2 little healthy squirrels were immediately isolated from these 5. 19 August: Little pox baby #1 who was euthanized. 19 August: Little pox baby #2 who was euthanized. ​By 25 August the pox lesions in the remaining 3 pox babies were starting to open. They would bleed and scab over, but several were infected (I tried to get all the pus out). Therefore, I started the remaining 3 pox babies on Trimethoprim- sulfonamide (TMS), a sulfa antibiotic, at 30mg/kg twice a day. I also started washing all the lesions several times a day with a mix of betadine, chlorhexidine and water. 25 August: Lila & Lucas spooning. ​This was a hard day: 2 weeks after being with the first little pox baby for 24 hours Lila & Lucas suddenly start showing signs of pox themselves. They both have about 4 pox each. And then, suddenly, the morning of 27 August, Lucas is unresponsive and passes away later that morning. It is unclear why he died, and a necropsy by the vets did not reveal any reasons either. It is unlikely that his death was caused by the pox. I had noticed that his head had an ever-so-slightly strange shape, and it is possible that he had some sort of brain/skull abnormality that caused his death. Despite the fact that Lila now has the pox I decide not to put her in with the other 3 pox babies as their lesions are now open and I don't know whether this may cause her immune system to get weaker. Despite various claims that there are meds that help the pox (such as zovilax), there is no real evidence for this, and as of yet it may be that only a strong immune system can fight this deadly disease. 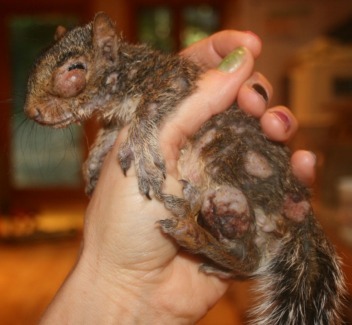 My friend Mandie, a superstar fellow rehabilitator in another state, gets in touch to tell me that on The Squirrel Board a few rehabilitators claim that Acyclovir, a medicine used to dry up chicken pox, also helps heal squirrels with squirrel pox (see info pages on Aciclovir and Zovirax). Acyclovir is the same as Zovilax as far as I can tell, but the Squirrel Board use it orally, not topically. Mandie sends me a bunch of Acyclovir as well as some Nystop powder (an anti-fungal powder used to help chicken pox) to be applied topically. 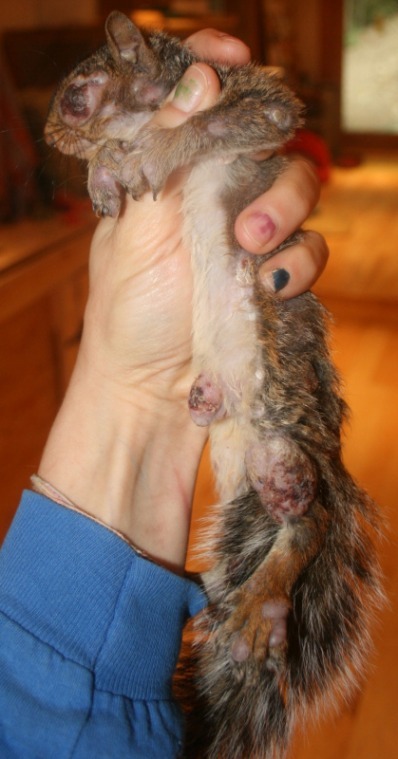 Again, squirrel pox is NOT a herpes virus in the way that human chicken pox is soall veterinarians I talked with said that these medications would not do anything to help. They had certainly been right about the Zovilax, but I wanted to give this a try anyway as it couldn't hurt and it is so frustrating not being able to do anything at all. I've had Lila for a month now. She is about 10 weeks old. She has 6 pox. 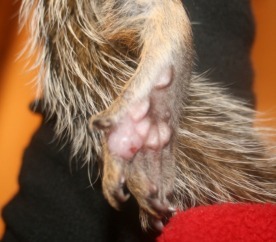 1 behind her right ear, one under her chin, 2 on her tail, and one on each rear foot on the toes). 5 September: 9/5, Lila. You can see the pox behind her right ear. 5 September: 9/5, A pox on one of Lila's back feet. Remember she had contracted the disease about 6+ weeks after the other 3 (who had probably caught it from their mother who may well have succombed to it, leaving them orphans). The other 3 I've had for 3 weeks. I'll call them Anna, TummyBoy and EyeGuy for clarification. TummyBoy and EyeGuy are both males and their names refer to where their pox are the worst. Anna, TummyBoy & EyeGuy are still on TMS at this point with their lesions being washed about 3 times a day. Here are pictures of all 4 a couple of days after I started the Acyclovir (at a does of about 0.1cc 3x/day slowly giving more as they grew, eventually to about 0.2cc) and Nystop (3x/day) regime. 5 September: Anna had at least 60 small pox all over her. 5 September: Anna had pox all over her front & back. 5 September: Anna had a few big pox too. 5 September: Anna had a foot that had a giant pox on the toes. 5 September: EyeGuy had really bad large pox all over. But he was eating well, active and gaining week so decided to give him a chance. 5 September: EyeGuy. You can see how big some of his pox are. 5 September: TummyBoy had a large pox in the middle of his stomach. 5 September: TummyBoy had almost none on his back. 5 September: TummyBoy had some very large pox along his left leg & side. These were constantly cracking and bleeding and TMS was needed to keep infection under control. ​4 September Lila is looking very sad and lonely and is not too active. I finally put her in with the other 3 and she perks up immediately. They all love to play together. 8 September Wow! 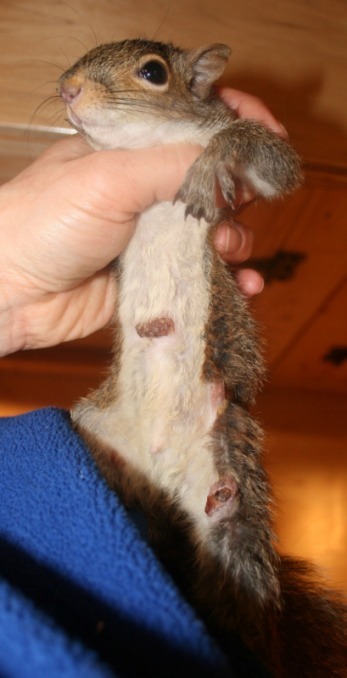 Many of Anna's scabs on top of the pox are loose and falling off. I help about 60 of them off. Remember she has lots of small pox, while the others have big ones. 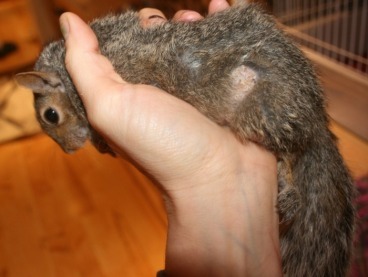 The others' lesions have hardly even started scabbing over well. Under her scabs is healthy pink skin! I take her off TMS on 14 September (started 8/25), but keep EyeGuy and TummyBoy on it. 10 September Until this point I had been had feeding the babies 10cc 2/day of formula (1Esbilac: 2water: 1 heavy cream), but today I start feeding them only 1/day (in the morning) and leaving a bowl of formula in their cage. 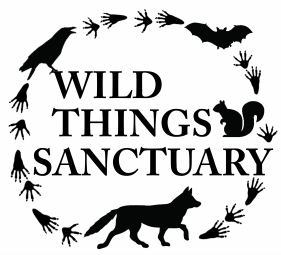 I CONTINUE TO GIVE THEM FORMULA (and other food too of course) THROUGHOUT THEIR WHOLE STAY AT WILD THINGS. Why not? I figure they can use all the good calories they can get while their bodies are fighting this disease. The Nystop powder runs out sometime around 9/10. I buy some anti-fungal powder at the drugstore and use this instead. But in my mind the best thing about the powder is that the talc probably helps dry up the pox, so for a few days when I don't have an antifungal powder I use baby powder and GoldBond powder and that seems to do the trick too. I also get some Chamomile Lotion that I figure will help on some of the worst lesions. Does it? I'm not sure. EyeGuy's eye is looking worse (if that's possible). I take him off TMS and put him on Baytril, which has better ocular penetration. He is still having his eye washed out and is still on TAO 2-3/day. After about 2 weeks on the Acyclovir, Anna is doing great (but her pox were small, though very numerous), Lila and TummyBoy are the same with no new pox but no real improvement either, and EyeGuy is worse and is getting more pox. 16 September: The pox behind LIla's right ear started to slightly scab over. 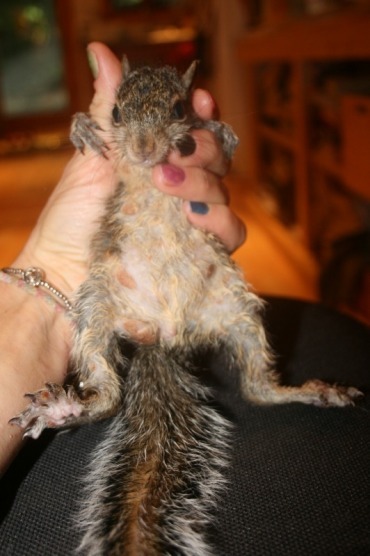 16 September: Lila had 2 pox on her tail. This one is white from a dusting of talcum powder. 16 September: The pox under LIla's chin was about the same. 16 September: The pox on Lila's toes were a bit bigger. 16 September: Anna is looking great. 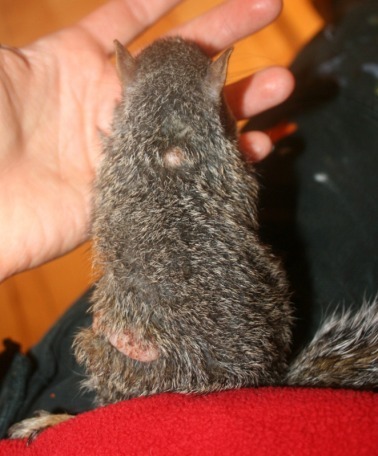 Most of her scabs over the pox lesions have fallen off and hair is beginning to grow back! 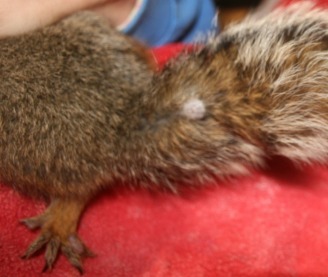 16 September: The hair on Anna's back is slowly growing back. 16 September: The pox lesion on Anna's left foot was so bad I honestly thought she would lose toes...but look at it now! Healing very nicely. Amazing that there were toes under that giant nasty pox! 16 September: Anna's beautiful pox free tummy! 16 September: As Anna got better, EyeGuy got worse. He developed more pox and the ones he had seem to get worse. 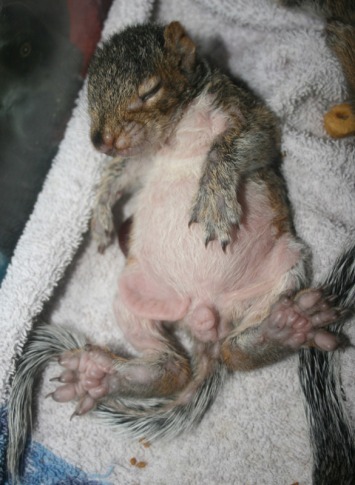 He was the runt and the first one that fell out of the nest and at this point I thought I should put him down, but I didn't want to let his awful appearance scare me into making that decision. He was still eating well and active, playing with the others, so I decided to give him a chance to fight the pox! 16 September: EyeGuy was getting more pox, here you can see that he started getting them on his ears. 16 September: EyeGuy the little fighter! 16 September: EyeGuy not looking great, but still eating and playing and enjoying his brothers and sisters! 16 September: EyeGuy started getting pox all over his feet. The one here on his thigh was nasty and very infected. 16 September: Though EyeGuy's eye looked bad I thought that the fact that it was scabbing over might be a good thing. The scab was very deep and you couldn't pull it off as I had done to Anna's pox. The pox along his neck and shoulder in this picture were all new. 16 September: TummBoy's pox on his neck may be a bit better. 16 September: TummyBoy's pox weren't changing much, though perhaps drying up a little. I think that topical talcum powder, anti-fungal or not, is a big help to the drying out process. EyeGuy is really not looking well, though he is active and eating well. I start thinking about whether I should put him down. 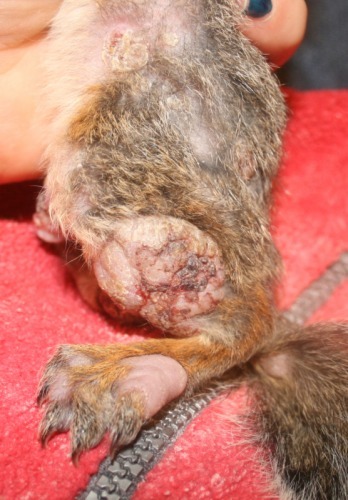 It's tough as I don't want to let the ugly presentation of the lesions scare me into putting him down. 20 September: EyeGuy had gotten more pox all over, including on his shoulders. EyeGuy dies. He is 204g. I have saved his body and hope to do a necropsy on him with one of my vets. I have heard that after a certain point the pox will spread internally and move to the internal organs, but I have not seen definite proof of this. I hope that his necropsy will be able to confirm or deny this report. Stay tuned. 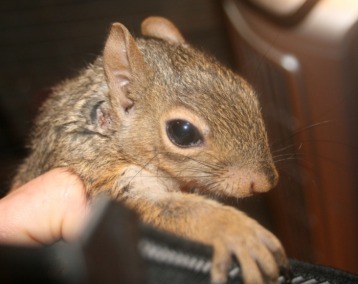 20 September: EyeGuy was the runt but always very strong and brave! 20 September: EyeGuy dies. His pox had gotten worse and more numerous despite the Acyclovir. 20 September: EyeGuy had gotten more pox on his tummy. 20 September: EyeGuy had also gotten more pox on his toes. 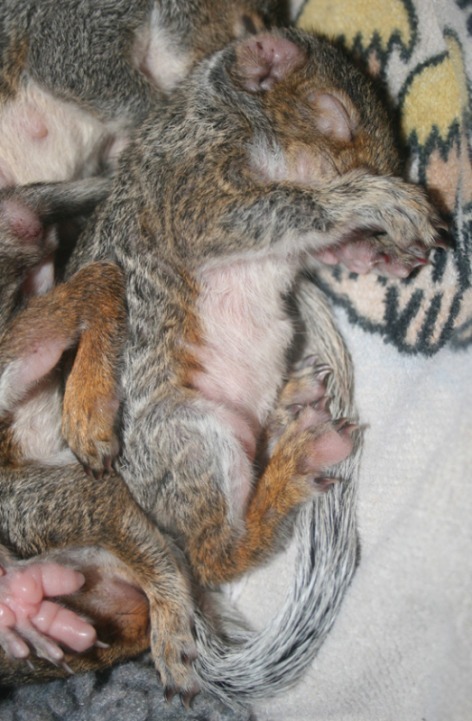 I start giving the 3 remaining babies NutriFeron which is supposed to boost immune function. I had tried to give them echinachea, but it had a really nasty taste. The NutriFeron comes in caplets. I dissolve 2 in about 600cc of water. I give this mixture to them in place of plain water. There is no taste to it. I also use a little in their formula until 1 October, at which point I figure that they are getting plenty in their water. TummyBoy's scabs are looking better and I take him off TMS. Now the babies are ONLY on Acyclovir 3/day at about a 0.2cc dose each time. I am also still putting powder on Lila and TummyBoy and cleaning any scabs as the need arises. 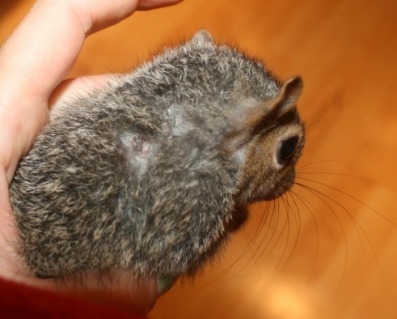 7 October: The scab behind LIla's right ear is slowly drying up. 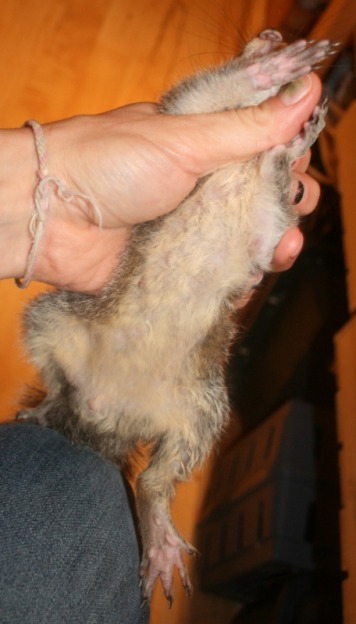 7 October: The scab under Lila's chin is slowly drying up as well. 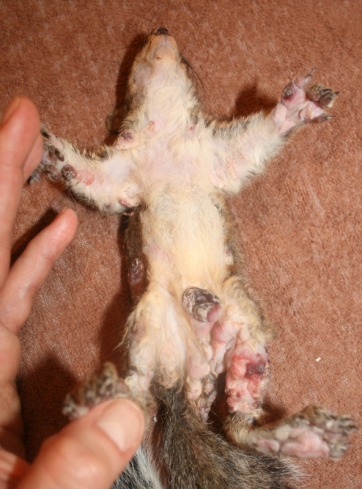 7 October: The two left photos show pox scabs on Lila's back feet. 8 October: The scabs fall off and reveal healthy looking toes as seen in the picture on the right. 8 October: Anna's scab free tummy! 8 October: Pox scabs on TummyBoy. 8 October: Anna & TummyBoy munching on walnuts. TummyBoy's tummy is looking so much better! 8 October: Anna & TummyBoy peak out to see if breakfast is coming! Lila's scabs come off! And all of TummyBoy's are almost off as well. Anna, TummyBoy & Lila are getting more and more rowdy and I decide to put them in a larger cage (about 4'x4'x2.5'). This will mean that I will not be able to catch them to give them their meds, but I think that they are OK and I decide to discontinue the Acyclovir and topical treatments. However, they are still getting NutriFeron in their water and will continue to do so until release. 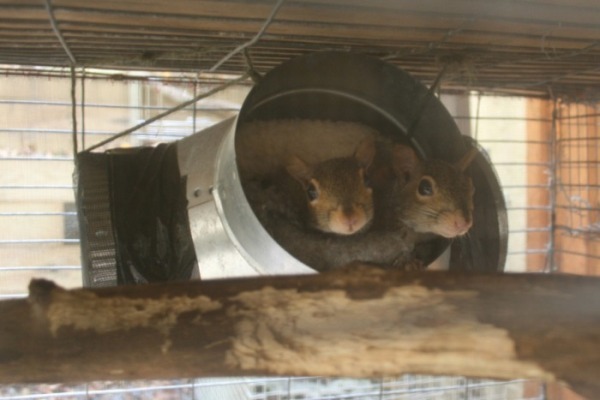 3 October: Anna & Lila peak out of a cozy house in their release cage. ​All 3 babies are looking great. TummyBoy still has some small bald patches but all scabs are totally gone. A snap of lovely weather helps me decide to put them in a release cage by my house. Release! Wow, what a long road it's been!! I'm sorry that not all of them survived, but I am so happy at Anna, TummyBoy & Lila's recovery. ​The big questions are: what meds, if any helped?? 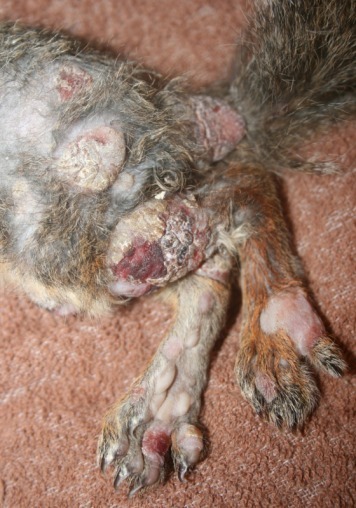 I think that the topical treatments worked, well NOT the Zovilax, but the topical cleaning and powders. I would like to believe that the Acyclovir helped and was so grateful that it was generously donated to these little squirrels by people on The Squirrel Board. But out of the 4 who were on it 1 died, 1 got better fast, and 2 really didn't seem to change much at all. To me this indicates that it may not have done anything at all. But of course I'd use it again, why not?? I just hope that some good research is done into this disease one day so we won't all just be guessing in the dark about how to help these little ones. 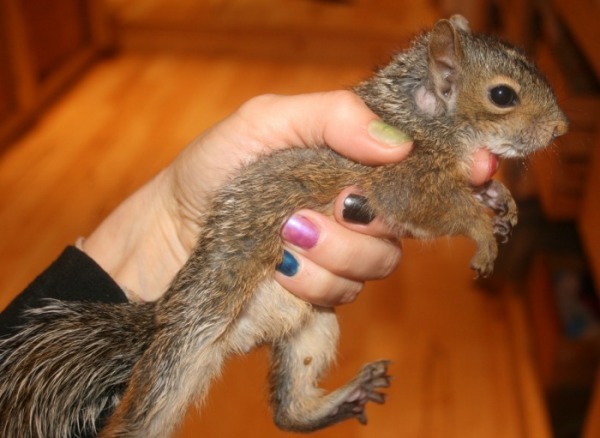 ​What About Outdoor Wild Squirrels? Can They Be Helped? 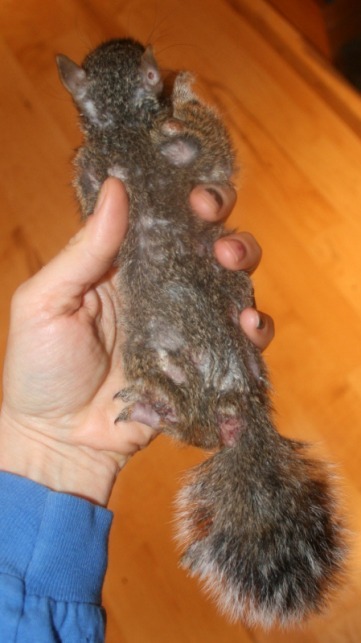 ​This page has proven to be really popular because there is so little out there about squirrel pox. It makes me sad that there is not more research about it and not more information on how to help these animals. 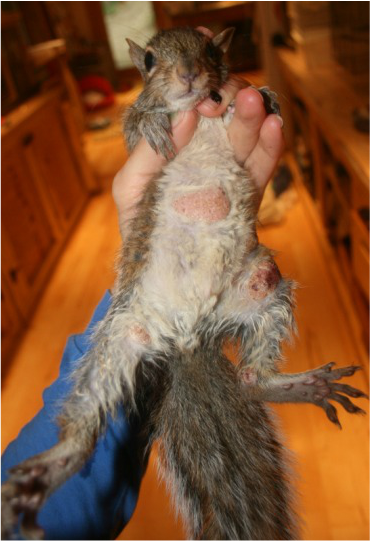 People email and call all the time about squirrels in their yards who have pox and what can they do? 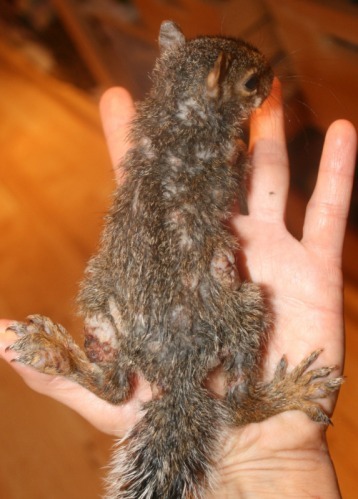 A few years after this case study a badly infected wild squirrel turned up in my woods. I knew that I was never going to be able to catch him, but I wanted to help. One thing that I remembered from the case study here is that whether or not an animal contracts and survives pox depends on how strong their immune system is. One way to make the animal stronger is to try to take away some of the daily stress that comes from living in the wild, and provide supportive care. So, for several months, whenever I saw this squirrel I made sure that I put out food and water for him. He looked terrible when he first arrived, but within 2 months you could hardly tell he had ever had pox! 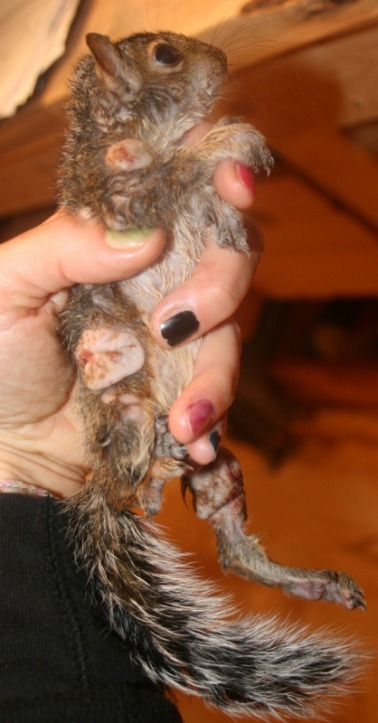 A real testament to what we can do to help wildlife in trouble just by offering supportive care! See photos below.